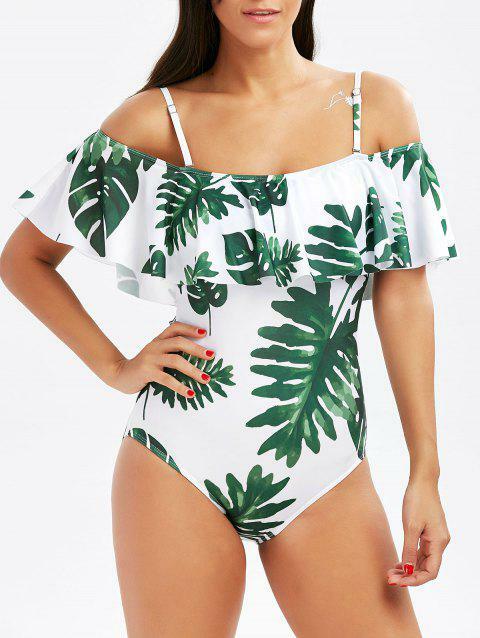 Tropical one piece bathing suit featuring off the shoulder design with flounce details, allover leaves patterned, and cheeky fit bottom. Removable and adjustable cami shoulder straps protect the swimsuit from falling down. Non-support padded cups make you perfect fit to the swimwear. Modest bathing suit. Soft and easy to wear. I must admit quality was much better then what I had initially expected for the very low price I bought it for. Beautiful and perfect fit! Recibí el producto en el tiempo establecido, en buen estado. Tela de excelente calidad igual a lo ofrecido en la foto. Me quedó perfecta! Q:Hi I am a uk12 so what size should I order please? According to the size chart, we suggest you choose size L.